In this week’s edition, we bemoan bitcoin’s continued slide at the hands of sad news that seemingly won’t let up, explain the connection between the major coin exchanges and potential price fixing, examine why one coin in particular continues to climb into the green, and link for you some of the more interesting articles to be published on CoinClarity earlier this year. The price of BTC sank some 10% on heavy volume over the course of an hour on Sunday afternoon as it came to light that Korean exchange Coinrail had been hacked of about $37 million worth of bitcoin. 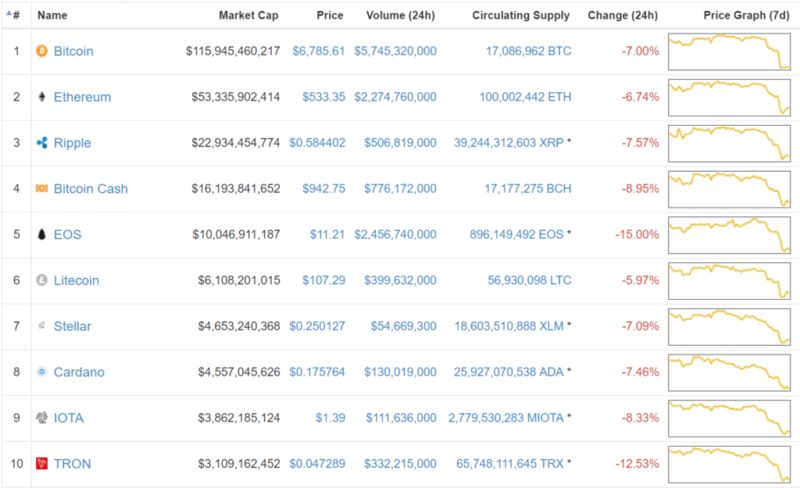 Unsurprisingly, the majority of altcoins followed suit, with all ten of the top coins by market cap exhibiting the same chart downward pattern. The weekend’s losses dragged the total market cap of all cryptocurrencies down below the $300 billion mark for the first time since mid April. As of Sunday evening, the top 15 coins by market cap were all suffering double-digit losses over the last 7 days, with EOS (EOS), Cardano (ADA), IOTA (MIOTA) and TRON (TRX) all down more than 20% in this time period. Bitcoin is now down over 20% in the last 30 days, and down over 50% for 2018. This recent slide in price was baffling to many long-time price watchers as Coinrail is only the 98th biggest cryptocurrency exchange by volume and therefore shouldn’t have much more sway over the market as an exchange this size typically does. Nevertheless, the amount of BTC lost by Coinrail equates to roughly 3% of all bitcoin currently in existence, which is not an insignificant amount. Korea is one of the heaviest bitcoin trading countries in the world, accounting for only 6/10ths of 1% of the world’s population but home to over 5% of all bitcoin trading volume on a daily basis. Bitcoin frequently trades at premiums as high as 30% in the Asian country of 51 million. Also named as a culprit for this weekend’s decline was a report released by the Wall Street Journal on Friday which detailed how four major bitcoin exchanges (Coinbase, Kraken, Bitstamp and ItBit) were being investigated by regulators for potentially being involved in price manipulation. While price manipulation in bitcoin is nothing new, its epidemic has reached sinister proportions thanks to the recent launch of Bitcoin Futures trading by the Chicago Mercantile Exchange (CME). The U.S. Commodity Futures Trading Commission has asked several major exchanges to share trading data after the settlement of the first futures contract and thus far most exchanges have refused to agree. Because futures trading products calculate the “index” price of bitcoin using a formula that includes prices from all four of the above-listed exchanges, this means that these exchanges hold an enormous amount of power over trading activity conducted in traditional exchanges like the CME. This means that inappropriate behavior conducted by the exchanges, such as price manipulation, could be immensely profitable since the money at play in traditional markets far exceeds the amount of money being actively deposited and withdrawn from the bitcoin exchanges themselves. Some bitcoin exchange CEOs are now questioning whether their agreement for participation in calculating the bitcoin index price is now worth it because of the recent heat put on them from federal oversight committees. In addition, Binance recently started offering coin pairings with top 10 staples Ripple (XRP) and Stellar (XLM), as well as a host of others, including Nexus (NXS), QuarkChain (QKC), NET (AGI), and IoTex (IOTX). Binance’s rise is being attributed to this new flux of coin pairings which make fee reduction via BNB all the more sought after a utility. In a market oversaturated by coins with purely speculative value, its refreshing to find one that actually has real-world applications, which also include partnerships with Monaco Visa and Uplive (GIFTO). Interestingly, Binance CEO Zhao Changpeng has been uniquely optimistic about bitcoin itself in light of this year’s downswing, recently pointing out the similarities between BTC price charts from 2012, 2013, 2014, and this year’s price chart in a recent tweet. Through chart comparisons he demonstrates how bitcoin has managed to prevail and move strongly upward after extended periods of bleakness and doubt, throughout the course of its existence, under the sincere impression that 2018 is once again a year ripe for massive gains. From 5/3 – Bitcoin busts out of wedge, Ethereum expands, and why do alt coins lose value? Plans for a $700 million bitcoin mining farm are underway for upstate New York, ironically one of the least bitcoin-friendly places on the planet. Low electricity costs ($0.03 per kilowatt hour, as opposed to a national average of $0.12), community support and an eager workforce are among the reasons for deciding the location of Massena, New York, which has a population of just 15,000. Because a bitcoin mining business doesn’t require one of New York’s infamous BitLicenses to operate, it estimated to be able to quickly turn a profit, though further south in the city schemes to undermine the financial freedoms presented by bitcoin are always being hatched. Tech titan Microsoft will likely be purchasing the independent software repository Github, made famous for hosting revolutionary pieces of software such as the original Bitcoin client as developed by Satoshi Nakamoto. The archive has already witnessed a mass emigration to alternative sites of software developers who fear Microsoft will use their power to crush innovative competition and protect their own monopoly of products. A new research study by blockchain forensics experts at Chainalysis concluded that only 10% of Bitcoin Cash is actually being used for transactions (the majority of which are exchange-related), with the remaining 90% being “HODLed.” The research suggests that Bitcoin Cash, which was originally presented as an alternative to bitcoin for those looking to escape its high transaction fees was not actually accomplishing its goal as such, which can be further confirmed by its lack of merchant adoption or integration with pre-existing, crypto-friendly online platforms. Coincidentally, in one of cryptocurrencies zanier stories of the week, a Bitcoin Cash “evangelist” was arrested for joy riding a lightly-armored vehicle through Virginia for almost 60 miles. The tank-jacker’s plans were quickly discovered on Twitter after he was identified, but what was perhaps more intriguing was his long history of tweets promoting the use of Bitcoin Cash and his insistence that it was, as head disciple Roger Ver might say, the “real bitcoin.” (Even though this can’t be the case because as we’ve gone to lengths to explain previously, bitcoin goes by the name “Bitcoin” and is identified by the symbol BTC while Bitcoin Cash goes by the name “Bitcoin Cash” and is identified by the symbol BCH. This more or less definitively explains which coin is the real bitcoin).